Last night I took part in World Book Night. It was this time last year I first found out about World Book Night when I was on the tube in London and a volunteer came up to me, told me about it and gave me a copy of The Spy Who Came in from the Cold by John le Carre. It was after this I vowed I would volunteer this year to raise awareness of World Book Night and share the love of books. In a nutshell World Book Night in the UK is where "20,000 passionate readers gift 24 copies of one of their favourite books to encourage those who don't regularly read to fall in love with reading. In addition World Book Night will be giving a further 620,000 books over the course of the year directly to the hardest to reach readers through prisons, care homes, hospitals, sheltered housing, homeless shelters, libraries and through other partner charities." 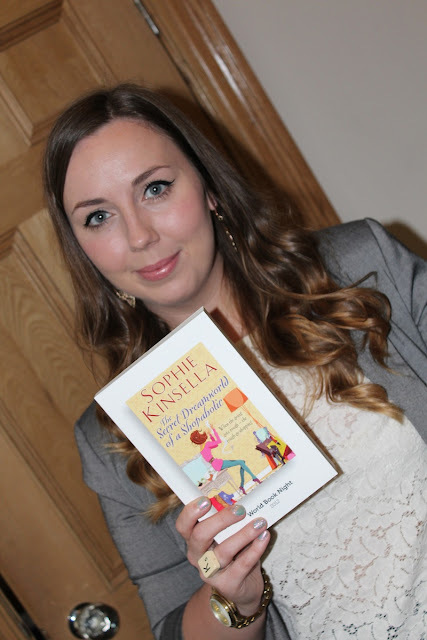 My chosen book was The Secret Dreamworld of a Shopaholic by Sophie Kinsella. I chose this as I thought it was an easy book to read for someone new to reading, and last night I went out in the rain and gave away my Wold Book Night books. I gave them away in the train station, hotels, my local Waterstones in Bradford, and of course outside shops. It felt really good getting involved and doing my bit, and I will most defintely volunteering again next year. If you want to get involved head over to the World Book Night Website and sign up :) Big thanks to my boyfriend for carrying the huge box of books around with me in the rain. This is such a good idea! Wish I'd known about it sooner!! This is really interesting! Cannot believe I've missed this, although I didn't see many volunteers in my city. I was a giver last year and would've done it again this year but I wasn't sure of being in the UK for the event. It is really a good idea, lots of great books to share!